The most important of the several Apollonias was the one in Illyria (modern Albania), the ruins of which are situated near the city of Fier. It was founded in 6th century BC by Greek colonists from Kerkyra (Corfu) and Corinth. Numerous Illyrians lived beside the descendants of the Greek colonists. Aristotle considered Apollonia an important example of an oligarchic system, as the descendants of the Greek colonists controlled the city and prevailed over the population of majority Illyrian origin. 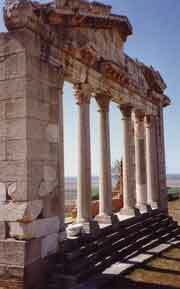 The Monument of Agonothetes dominates the ruins of Apollonia, Illyria. It commemorates the death of a high-ranking official's soldier brother and was the assembly place of the local council. Apollonia, like Dyrrachium further north, was an important port on the Illyrian coast and one of the western starting points of the Via Egnatia leading east to Thessaloniki and Byzantium in Thrace. The city was for a time included among the dominions of Pyrrhus of Epirus. It came under 229 BC it stood under the control of the Roman Republic. 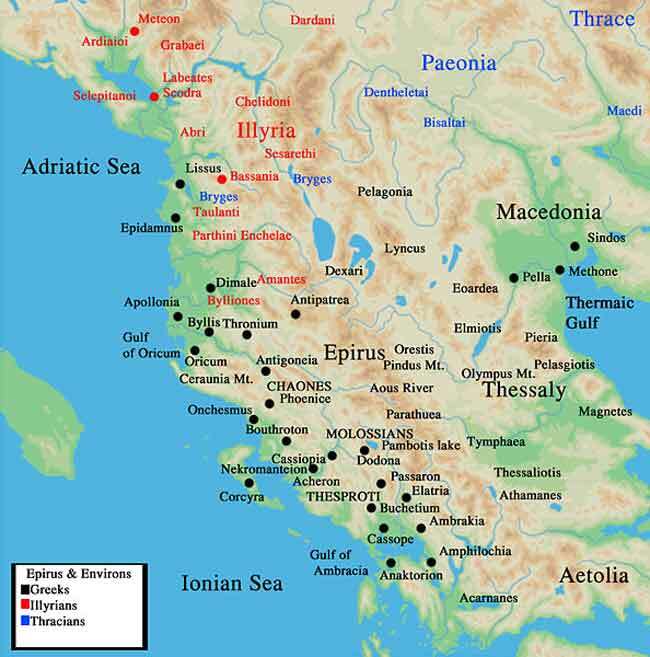 In 148 BC Apollonia became part of the Roman province of Macedonia, later being incorporated into the province of Epirus. In the civil war between Pompey and Julius Caesar supported the latter, but fell to Marcus Iunius Brutus in 48 BC. The later Roman emperor Augustus studied in Apollonia in 44 BC under the tutelage of Athenodorus of Tarsus; it was there that he received news of Caesar's murder. The decline of the trade center (which flourished even during the time of the Romans) started in the 3rd century, when an earthquake changed the path of the Vjosa river, and subsequently the harbour silted up. Christianity was established in the city at an early stage, and bishops from Apollonia were present during the Council of Ephesus (431) and the Council of Chalcedon (451). In the 14th century a monastery dedicated to the Virgin Mary was built. Today archeological discoveries are on display within the monastery. Some relics from Apollonia are also in the capital Tirana. During the anarchy that followed the collapse of the communist regime in 1990, the archeological collection was plundered. The ruins were also frequently dug up by plunderers to be sold to collectors abroad. Michele Fasolo: Da Apollonia e Dyrrachium ad Herakleia Lynkestidos. (= Viae publicae romanae. Bd. 1: La Via Egnatia) Roma 2003.